In the year 2006, the original project was resumed, setting up the remaining 9 holes to finally conclude a championship course with 18 top class holes. Its design meets all expectations for both professional as well as amateur players. The old rule difficult par, easy bogey has been the maxim when laying out this course. Its clubhouse has also been renovated and extended by a new building with a bar and a restaurant. 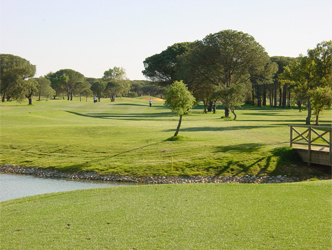 The first 9 holes are played on a parkland course surrounded by the wonderful, large villas of San Andres housing estate. In this area you will need accurate and long strokes to overcome the pine woods and the water hazards. In the second round, the numerous, aged, olive trees and three large ponds will come into play. The broad greens will incite you to excel yourself once and again. A championship course in which all players can be put to the test regardless of their level. When the game is over, our large, inviting facilities call for a rest. Our terrace with its marvellous view over the first fairway, and our trendy, pleasant restaurant in the clubhouse, will give you the chance to share the experiences of the day enjoying a glass of fine wine and our popular, local tapas (small, assorted food servings). Special priser för golf paket och även 3,4,5 och 6 rundor golf på Novo Sancti Petri. De har även extra 10 procent extra rabatt för early bookings.